S. Lokukarawita Karapitiya Group Corr. According to documents at the Galle Municipal Council, they are shanty dwellers - though it is now politically true to call them low-income residents. And whether the categorisation likes it or not, they have children for whom they wish to ensure a sound education. There is nothing wrong with that. The government is bound to treat all children alike. Over three decades ago, the Galle Municipal Council provided them houses making them official residents of the area. But, despite this bureaucratic opening, their grandchildren have been socially barred from being admitted to a famous national school in Galle. The reason is that their families are still living on the small block of land, categorised as ‘shanties’ by the local authorities. The school is none other than Southlands College, located within the Galle Fort premises. 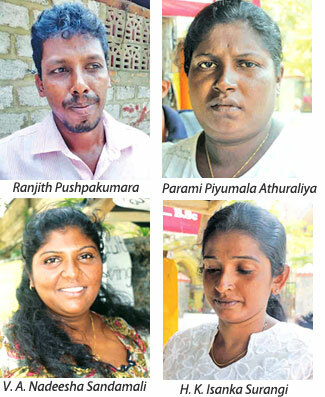 They have refused to open their prestigious doors to four girls who come from families living in the Galwatte and Cheenakoratuwa areas. For the last 29 days, their parents have been protesting before the school. Last week they took their protest to the Education Ministry and a letter with their grievances was handed over to the Secretary to the Education Ministry. Their protest may not hit the headlines, but their story is that of a fundamental violation of human rights and the right to education which the government promises above all. An issue with regard to the admission of these children cropped up with the Education Ministry circular released in 2018. The circular states that if the land has been gifted to the owner by the government and if the owner has passed away, he should then have legally named his spouse or next of kin as the present owner of the land. Further, this land succession needs to be proven with valid documentation. There are various title deeds gifted by the government to the people. If the person has received a Swarnabhoomi or Jayabhoomi title deed, there is no obstacle to name the person’s wife or child as the owner of the land after his demise. But those who live on land categorised as ‘shanties’ received ownership of the land simply through a document signed by the Galle Municipal Commissioner and Mayor on May 21, 1987. This was not a title deed to the land. Forty-four families were thus given a three-perch block of land to live on. This permit, rather than a deed, also came with seven conditions. The first condition was that the land cannot be sold, leased, bestowed on another or exchanged. The fourth condition states that with the demise of the first owner, the block of land could only be written to the next of kin and no one else. The seventh condition finally states that the permit would be considered valid until and when it is converted by the government to a full title deed. To this day, however, none of the families has received a full title deed. But the families who were located there have been paying their rates and taxes to the Municipal Council since 1987. 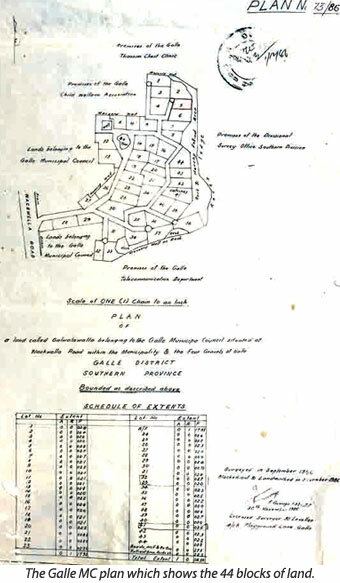 Further, they have even obtained electricity and water connections to these addresses over the years. Three families living in Galwatte and one family in Cheenakoratuwa have had their children denied admission to Southlands. They explained that though they had applied to have their children admitted to grade one this year, their applications had been rejected. When they appealed the decision, they were informed that they did not have deeds proving their legitimate ownership of the land they lived on and thus had no proof of residency. “We were given this land along with the title ‘shanty dweller’. Do we not have access to a school for our children because of that?” asked the parents. “In 1987 my father received the No. 37 plot of land in this watte. My husband’s family is also from Galwatte. I am the only child in my family. I had submitted an application to admit my only child to Southlands. My father passed away some time ago. My mother and family live in this house now. This land was only given on a permit, not a deed. From the day it was given, my father and my family after him, have been asking that it be turned into a deed. But, the government refused. Now Southlands Principal says that as we have no deeds, they cannot admit our children into the school. It is the closest school to our house and thus we get preference to Southlands. Are we being treated thus because we are from Galwatte?” asked V. A. Nadeesha Sandamali (35). H.K. Isanka Surangi (36), a resident of No. 5, Galwatte, is an old girl of Southlands College, but she now finds that she cannot admit her own daughter to her old school. Ranjith Pushpakumara (42), who was born and bred in Galwatte, admitted his two elder sons to St. Aloysius in Galle using this address. But the same address as a proof of residency was rejected when it came to his youngest daughter who was hoping to go to Southlands. “Now they ask us to bring a title deed. We have proved our poverty enough. We live on land given by the government. Just because our houses have been built on small three-perch blocks, our children have been refused by a national school. We ask the authorities to look into this. It is only Southlands which has an issue. All the other schools in the city have admitted children who come from our area, with the land permit we possess,” said Pushpakumara. Parami Piyumala Athuraliya (36) went to Sacred Heart Girls’ Convent in Galle. She has four sisters who are all married and have moved away from their home in Cheenakoratuwa. As she is the only child living at home, her father had given her a sworn affidavit stating that the land would be owned by her after his demise. Given that the government was currently running a programme to hand over title deeds to landless families, the Daily News inquired of Galle Kadawath - Sathara Divisional Secretary Himali Rathnaweera as to why these families have been left out. “These families live in an old, abandoned quarry. This place is not suitable for habitation, and we have been informed of this by the Geological Survey and Mines Bureau. So we cannot give them title deeds to these lands. We need to resettle them elsewhere, so we need to build a housing complex. Until then we cannot give them title deeds,” she said. When the Daily News spoke to Southlands Principal Sandhya Pathirawasam with regard to not admitting these children to school, she reiterated that the school treated all applications equally. Where are the real people of Galle Fort? Those who have been unjustly treated pointed out that they, like many others, could produce falsified documents, but they did not do so. Many who do not even live inside the Galle Fort have admitted their children to Southlands, they alleged, adding that even children coming from distant places like Neluwa and Thawalama have been admitted to grade one this year with forged documents. The protesters also have a letter in hand which was written by Minister Vajira Abeywardena to Education Minister Akila Viraj Kariyawasam with regard to the issues which have cropped up as a result of the circular. The letter asks the Minister to take a policy decision regarding 12 families who could not admit their children to government schools as they do not have title deeds to places which they live in. But no such policy decision has been made as yet. 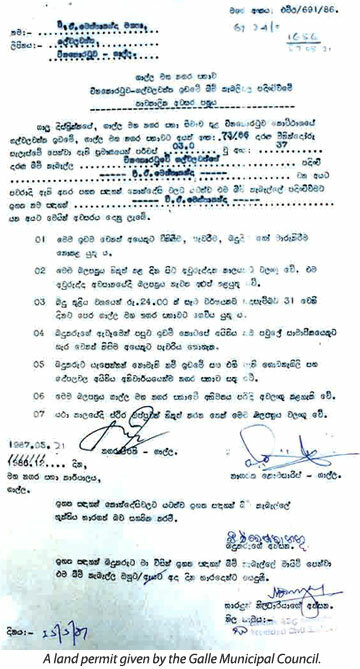 Despite these issues with admitting the children to Southlands, in 2019, children who are being admitted to Richmond College, Galle, were allowed to prove their residency with other documents such as the applicant’s National Identity Card, school leaving certificate, marriage certificate, life insurance certificate and child’s birth certificate. Residents of Kovilwatte too face the same land ownership issue as those of Galwatte, but they were able to submit above documents instead of the land permit to receive 48 points that made their children eligible to be admitted to Richmond College. The same was done at Vidyaloka Vidyalaya and Mahinda Vidyalaya. The parents who are currently protesting have all the above certificates to prove their residency at Galwatte. But Southlands Principal has not even allowed them to face the interview in order to submit these documents. The question thus is, what law or circular allows Richmond College to act in one way and limits Southlands’ actions at the same time? Are they both not national schools? During the Galle Kadawath - Sathara Divisional Secretariat coordinating meeting on September 3, 2018, it was revealed that 74 new families were issued with Grama Niladhari certificates to prove that they were residents of the Galle Fort. The Galle Fort only allows 276 houses, and thus it was revealed that these 74 could not be long-term residents. The meeting also revealed that this racket was being carried out to admit children to Southlands College. Officials pointed out that due to many people forging rates and tax notices thus to admit their children into national schools in Galle, many true residents in Galle town were losing their legitimate opportunity to send their children to these schools. The Education Ministry authorities thus have to inquire as to whether their circular has truly curbed illegal admissions or whether they are keeping the legitimate out. More importantly, they need to ask whether these parents are losing out on a national school because, in 1987, the government branded them as ‘shanty dwellers’ who are to live on three perches of land in perpetuity.